An essential part of any business is accurate accounting of financial data, or General Ledger information. From cash balances to profit and loss statements, to month and year end closing routines you can increase control, record and analyze your financial information with Beyond Software. 24 hours a day, 7 day a week access to real time data allows you to make informed business decisions that will optimize cash flow and maximize profits. The ability to setup budgets and manage your finances in accordance with the budgets provides the financial team confidence the business is on track for success. Beyond Software offers all of this plus secure access, by individual user, to view and manage only the data they are authorized to access. Data can be viewed by standard reports, as well as, consoles which allow you to quickly and easily conduct powerful self-service analysis that delivers relevant insight into your projects and financials with the option to export the data to Excel for further analysis. When you are satisfied with the data on a report, you can print it or export it to a file and work with the report in other software, such as Excel, to further analyze it or analyze ‘what if’ scenarios. With accurate data at your fingertips, you can forecast various scenarios and develop contingency plans to keep a healthy financial status through good times, as well as, slow times. Maintain and monitor cash flow. 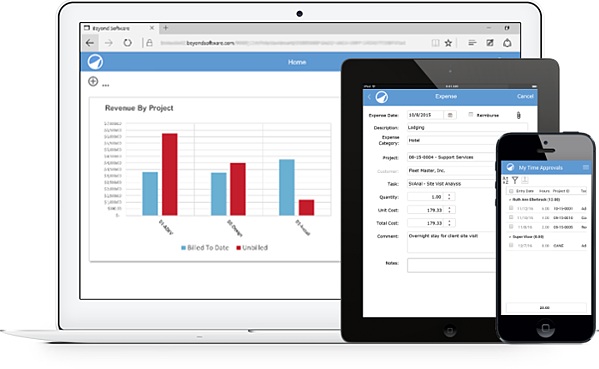 Beyond Software’s General Ledger makes it easy to maintain and monitor cash flow so you always have up to date information on your revenue and expenses. A proven security model protects your data from unauthorized access. Tight integration with non-financial applications, including project management, enables your organization to connect your project and financial accounting to provide insight across your entire organization so projects are delivered on time and on budget, allowing you to maximize the profitability of each project. Financial reports may be printed or saved to electronic file in multiple formats including .xlsx, .csv, .pdf, .xml, .mhxml, .tif, or .doc. Once data is saved to an electronic file you can use other software, such as Excel, to manipulate the data further. This data can also be used to integrate with other software products or prepare for presentations and board meetings. Financial reports allow you to drill into the source transaction when you need to trace the details back to their origin. Closing the General Ledger for the month and year is simple. You can continue to enter daily transactions, such as time and expense, during the closing process and know that your data is going to the correct period/month. You can set up an unlimited number of accounts in Beyond Software, and have an unlimited number of transactions. Accounts can be structured with identifiers for Account, Department, Territory, and Product. These labels may be configured to match your industry terminology as needed. Standard reports including GL Trial Balance, Balance Sheet, Income Statement, Cash Requirements and many more. Flexible reporting is available via standard reports and consoles with easy to use filtering and sorting capabilities. Budgeting and Statistical entry along with an easy to use Excel Budget import. Beyond Software allows you to create recurring entries and recurring allocations.